A Riak Management plan is a wise and some might say, imperative document to have in running s business, but could be applied to many things in life, even your own life. I know the idea of writing one seems quite boring, and in some cases it is, but try to understand its importance. To me, risk management is an almost philosophical understanding that life is not linear, and things go wrong, sometime catastophically. A Risk Management plan takes this understanding into account, and is a culmination of how to deal with business problems and having something in place to deal with that scenario. That is why it is important to try your best to think of everything that could go wrong the best you can. We need company name, in this case called "Sustain-Tech Pty. 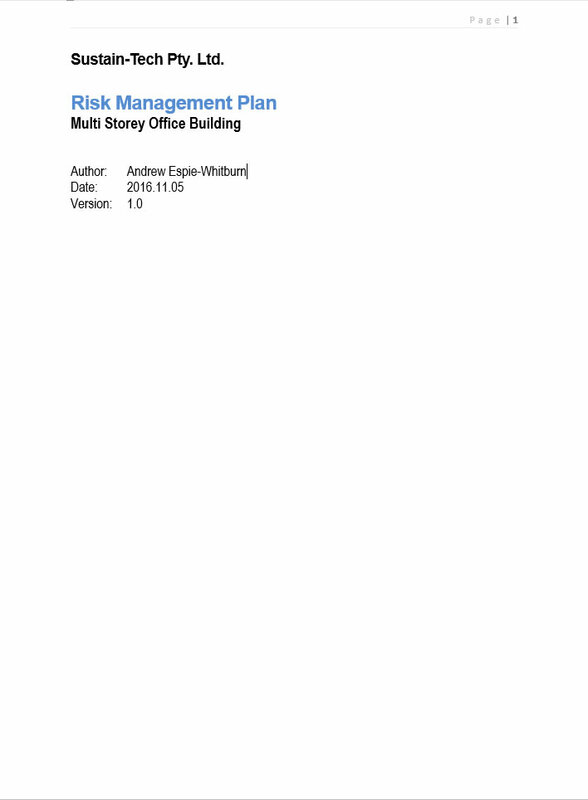 Ltd"
Title of Document: "Risk Management Plan"
Project Document is for: "Multi Storey Office Building"
Author of Document: "Enter Name Here"
Date Document was written / Updated: Enter Date Here"
Sustain-Tech Pty Ltd recognises the importance of implementing a Risk Management Policy. 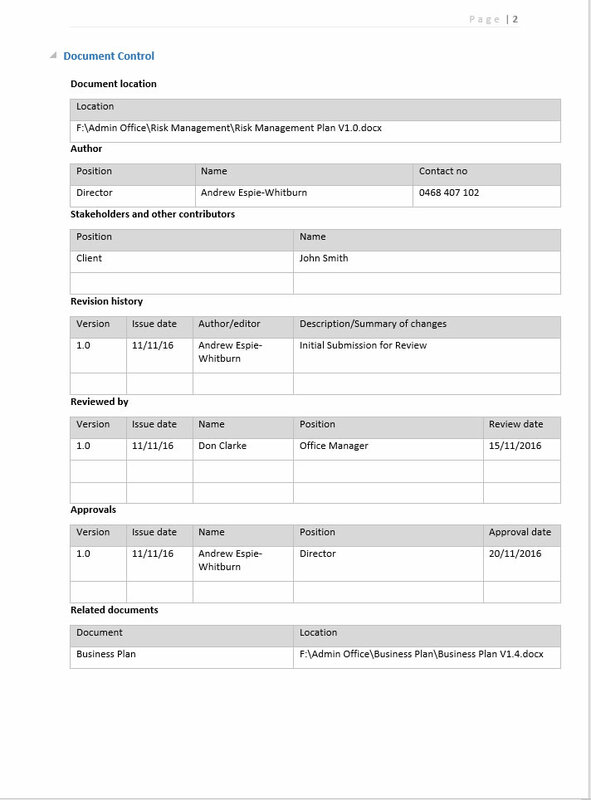 This risk management policy is an encompassing policy statement about the role of risk management within Sustain-Tech Pty Ltd and the associated responsibilities of directors, management, employees and contractors. Risk is defined as the chance of something potentially occurring which would adversely affect and impact a project. Risk management is identifying, evaluating, analysing, treating, monitoring and reviewing the risk. 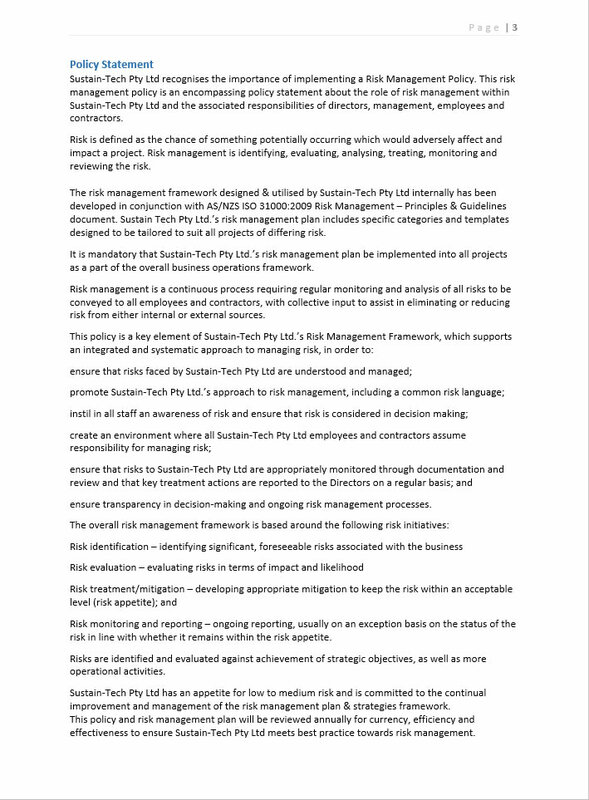 The risk management framework designed & utilised by Sustain-Tech Pty Ltd internally has been developed in conjunction with AS/NZS ISO 31000:2009 Risk Management – Principles & Guidelines document. 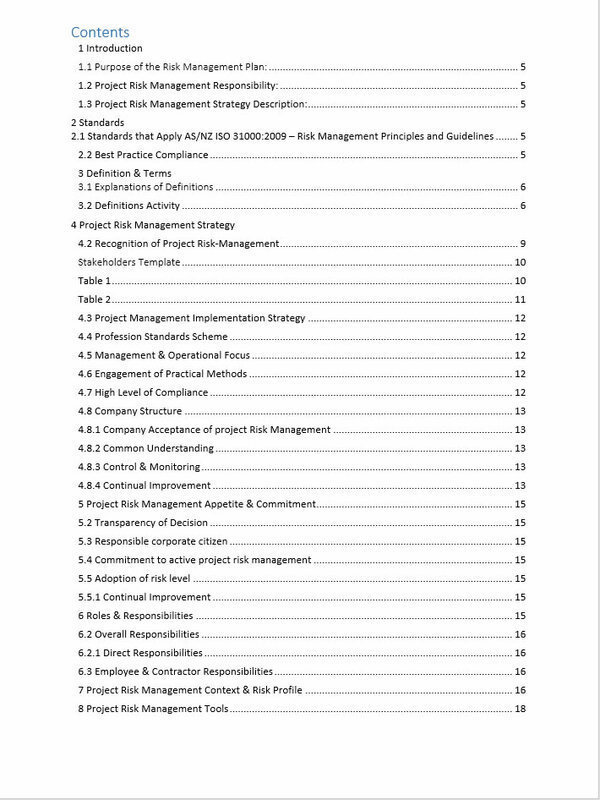 Sustain Tech Pty Ltd.’s risk management plan includes specific categories and templates designed to be tailored to suit all projects of differing risk. It is mandatory that Sustain-Tech Pty Ltd.’s risk management plan be implemented into all projects as a part of the overall business operations framework. Risk management is a continuous process requiring regular monitoring and analysis of all risks to be conveyed to all employees and contractors, with collective input to assist in eliminating or reducing risk from either internal or external sources. Sustain-Tech Pty Ltd has an appetite for low to medium risk and is committed to the continual improvement and management of the risk management plan & strategies framework. This policy and risk management plan will be reviewed annually for currency, efficiency and effectiveness to ensure Sustain-Tech Pty Ltd meets best practice towards risk management.